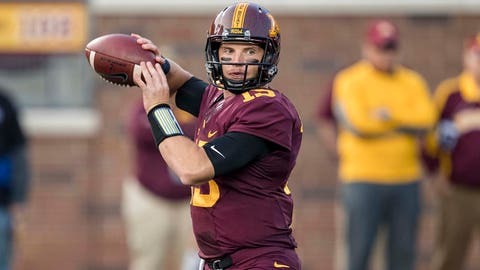 MINNEAPOLIS — Conor Rhoda is taking over for good as Minnesota’s quarterback. Brent Stockstill may have a banged-up shoulder, but he says he won’t let it stop him from leading Middle Tennessee State on another upset quest. Quarterbacks will be the center of attention when the Golden Gophers (2-0) host the Blue Raiders on Saturday, hoping to deliver a little payback after Middle Tennessee eliminated Minnesota in the NCAA men’s basketball tournament in March. Rhoda shared the job with Demry Croft through the first two weeks of the season, with coach P.J. Fleck openly hoping to see one of the two grab hold of the job through his performance on the field and leadership off of it. After a 48-14 victory over Oregon State in which Croft was benched for much of the game because of a fumble, Fleck made the call to make Rhoda the starter. That decision was only strengthened when Fleck announced on Tuesday that Croft would not be with the team against the Blue Raiders because of an unspecified disciplinary matter. It remains unclear how long Croft will be out, but Fleck intimated that it would be for more than just one week. There is no debate who leads the Blue Raiders (1-1). Stockstill owns Middle Tennessee career records for touchdown passes and yards passing per game and has endeared himself to teammates with his toughness. Last week in a victory over Syracuse he finished the game despite taking a crunching hit to the shoulder. He led touchdown drives on three straight possessions in the second half of the 30-23 victory. Brent Stockstill had an MRI earlier this week, but said he expected to play on Saturday. Fleck and Rick Stockstill have met before, when Fleck’s Western Michigan team played Middle Tennessee in the Bahamas Bowl in 2015. The Broncos beat the Blue Raiders 45-31 to snap a six-game bowl losing streak. That experience does not figure to help Stockstill much in preparing for the Gophers. “I’m sure he did some things at Western Michigan that he’s not doing at Minnesota because he’s got some different personnel. … I don’t think that will have any bearing whatsoever,” he said. Minnesota sophomore receiver Tyler Johnson ranks seventh the nation with 268 yards receiving this season on 10 catches. He had 14 catches for 141 yards all of last season.